Need a way to tell your customers about your special upcoming event or to tell them “Thanks!”?... now you can include your business card inside the greeting card with the business cards slits! Custom printed, UV coated greeting cards with business card slits are a great product to put your personal touch on. 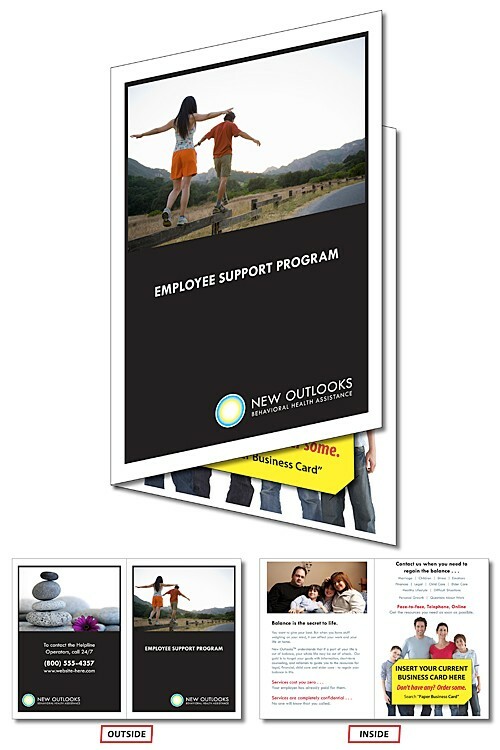 Printed in full-color (four color process) front and back, outside and inside, and scored to fold easy come with plain white envelopes included. Business Cards are not included with product. Plain white envelopes are included. UV-Coated on outside only. Business Card Slits are die cut into the card. Cards are shipped flat with a score to make it easy to fold. Price includes printing in full-color (four color process) on both sides, UV-coating on outside of card only, and plain white envelopes. Exact color matches, metallic or fluorescent colors cannot be printed in full-color.